The StrobeGuard SS-125 is a single enclosure obstruction light designed to meet or exceed the requirements of Advisory Circular 150/5345-43. 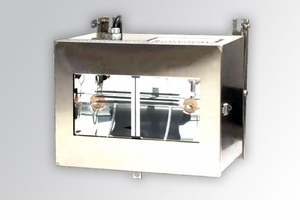 The enclosures are fabricated from 304L stainless steel. All plug-in printed circuit boards are protected with a coating which meets the physical and electrical requirements of MIL-I-46058B. The SS-125 is supplied with a lightning arrestor capable of withstanding repeated 10,000 ampere current surges. Operated with the SS-122 Controller, the system is completely self-activating for monitoring and identifying any malfunctioning light and is equipped to initiate a remote alarm. The number of SS-125 obstruction lights used on an installation depends upon the type of obstruction and its height.